As The Rabbits sing: "Saturday is the best day of the weekend. Saturday is the best day of the week," it will be no different this Saturday. My birthday is tomorrow, Wednesday, which is a terrible time to celebrate anything, so I am moving my bday fun to Saturday. 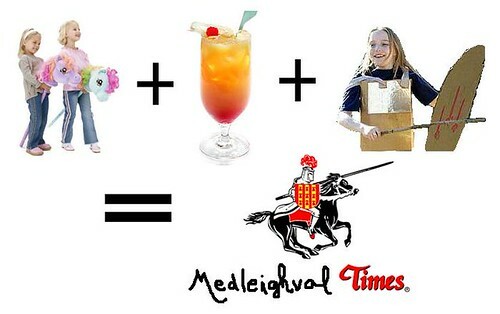 My original plan of going out to Medieval Times this weekend is off since it's way too expensive. At 10 cent wing night at Cleo's yesterday, it was decided that we are going to have our own version of Medieval Times Saturday instead. You should show up around 2pm and the party will go on until it's near dark, or maybe later even though i'll be popping over to Nadia's bday party later that night (if anyone wants to come with, let me know). There was talk of spraypainted cardboard swords and hobby horses used for jousting. Honestly, I don't know if anyone is going to actually make a hobby horse out of cardboard, but fun times will happen, as always, at 1735. I think I might go buy a pinata, or does someone want to bring a pinata filled with candy not containing gelatin because that would flipping rule? If not, I guess I'll find one, maybe shaped like a dragon! Also, if you are feeling creative, you should make a hobby horse of your own to compete in jousting for my love (which is all Zachary's, but this is just for show). Since it's my bday celebration, I really don't want to buy a whole bunch of stuff for this party. I'd appreciate it if you can BYO liquors and not make our floor as dirty as it was after our swap soiree. Becky said she'd bring over another blender, but blenders are good for making the fruity girl drinks we plan on making, so if you have one, you could bring it along too. yr birthday bonanza sounds like it is going to rule & i really wish i could be there to joust and celeighbrate! but, you know. all this moving junk is just as fun. except not at all. Hahahah, MedLEIGHval! And it should've been TYMES! Awww, happy (early) birthday Leigh!! Wish I could party with y'all on Saturday. Pour some coke out of your chalice for me. Happy birthday!! Sounds like your party's going to RULE. Tomorrow is Dave's b-day too, and ps we're coming out for the pitchfork show(yay!! ), so if you want to meet up and do some shopping at the crafty part or something, let's rock! totally forgot to write you back about this but was reminded in your post i just replied to (god i love gmail's search function). YES, let's hang out at pitchfork. yeah happy birthday, i'll still call you tomorow. so we are to meet at your crib? I have requested pinatas for my birthday too. May babies are the best ladies! At the very least I will see you Saturday night, Saturday is going to be a little crazy with Momz in tow. i hope you have a super happy birthday, leigh. it was good seeing you, albeit brief.